By Miriam Rasch, December 6, 2016 at 8:39 am . About the publication: In March 2015 Allahyari and Rourke released The 3D Additivist Manifesto, a call to push creative technologies to their absolute limits and beyond into the realm of the speculative, the provocative and the weird. 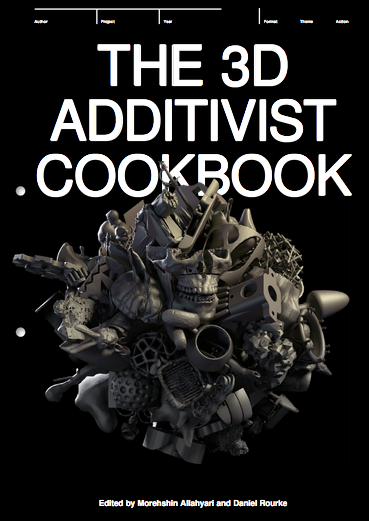 The 3D Additivist Cookbook is composed of responses to that call, an extensive catalog of digital forms, material actions, and post-humanist methodologies and impressions. The 3D Additivist Cookbook was designed with The Laboratory of Manuel Bürger (Manuel Bürger, Simon Schindele and Alexander Papoli), and is published by the Institute of Network Cultures (Amsterdam) as a 3D PDF and print-on-demand publication. The Cookbook was produced as part of transmediale 2016’s Vilém Flusser Residency Programme for Artistic Research with support from the Ernst Schering Foundation (Berlin) (transmediale is a project of Kulturprojekte Berlin GmbH in cooperation with the Haus der Kulturen der Welt funded by the German Federal Cultural Foundation). The #Additivism project was also realised with the support of Autodesk/Pier 9 (San Francisco), Colab at the Auckland University of Technology, Emergent Digital Practices program at the University of Denver, Frank-Ratchye STUDIO for Creative Inquiry at Carnegie Mellon University + VIA Festival (Pittsburgh), Jeu de Paume + Disnovation.net (Paris). With editorial support from Rita Macedo, Shane O’Shea and Miriam Rasch.